Searching for Bonobo in Congo » A Park for Bonobos? Do the Ancestors Want It? We tried to convince MamaChefitaine, the Chief of the Bangengele, that a park was needed in her lands along the Lomami River. She did not disagree, but she was reserved. For many months she remained reserved. Then, one morning she came to the TL2 way-house in Kindu. She is a woman whose size and assurance command attention. She walked in with something to say. Before John or I could offer, she pulled out the chair at the head of the table. MamaJose hurried in to pour a cup of tea. She bobbed in deference as she handed the cup to the chefitaine. 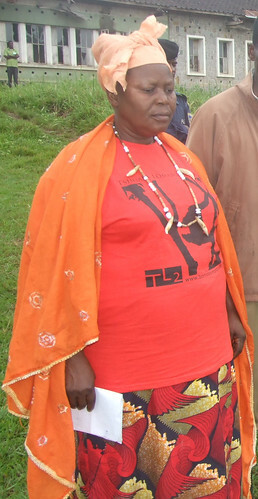 The chief of the Bangengele is an impressive woman. I was first introduced to “tambiko” on the Rwenzori mountains in 1975. 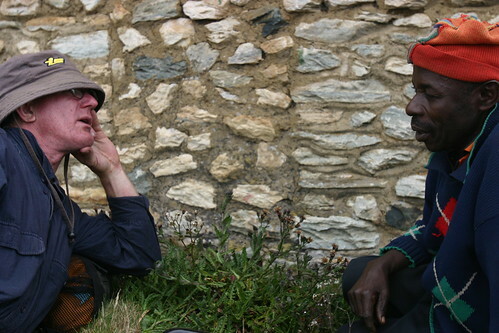 John at the third cabin on the Rwenzori mountain in 2005. The porter on his right was also with us when we climbed in 1975. Photo by Kim Gjerstad. We had climbed past the gardens and mango trees; we had been climbing through forest for some time, when our guides stopped in a little clearing. There was a cluster of Mangongo leaves, large and flat on the ground; on top of them a few crumpled Zaire notes, a bit of cloth. One guide swung off his basket-pack and ripped a single banana from the cluster at the top of his load; the other porter put down a bit of salt. John did not hesitate. He already knew something of “kutambikia”. He pulled out a few low-value Zaire notes and tossed them on the pile. We climbed the next four days without incident…up to the border of the equatorial ice. 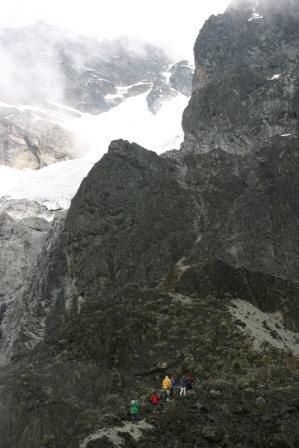 The last day, we climb to the glacier in 2005. Photo by Kim Gjerstad. So we “tambikia-ed “, but to do so we had to find a descendent of the right ancestors. The Walese had become scarce. The Walese-dese are, in fact, a disappearing ethnic group. Now along the Ituri road there are mainly Nande, Bila, Ngwana, and Ndaka. Their elders would not do. They could not call the long-gone generations of Lese that once lived in tiny hunting and banana farming camps deep in the forest. 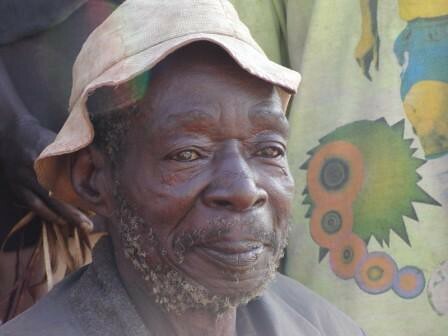 We found one old man, Bakana, head of a tiny remnant Lese village along the road. He was willing. One of the few old Lese-Dese chiefs along the Ituri Road. Maybe the only one –? He hiked the 24 km out to our camp, belying his wizened appearance. He had a live chicken in his hand, he pulled feathers from it all along the way: a few at each stream crossing, a few at the top of each hill, and a few at barely visible side paths, still used by Mbuti (pygmy) hunters. John and I followed behind with about ten of our local collaborators, Mbuti, Bila and Ndaka. Arrived at our camp site, a fire lit, an alter built, the chicken was slaughtered. 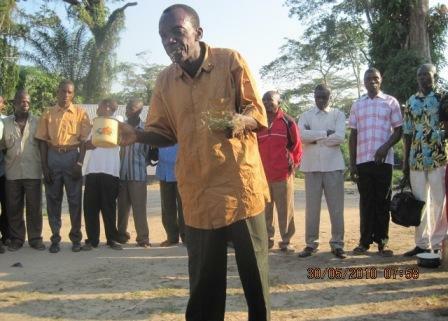 Refusing rest, old Bakana pulled himself to full height. With his hands in the smoke of fresh forest herbs, he called out a long litany of ancestors. In the complex Kilese I caught only the words I recognized as names — there were many. With all those ancestors on our side, we could not fail…and we didn’t. 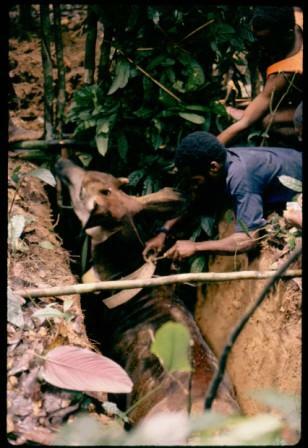 Dieudonné, one of our team, fastening a radio collar on a male okapi. Now, here, in this river rutted forest of the TL2 lowlands, in 2010, what did “tambiko” mean? Who was going to call out the ancestors? And how will this change the chiefs’ acceptance? Mamachefitaine explained that all the Bangengele chiefs had to be called together, not just those who had ancestral lands in the future park . They could not just say “yes” or “no”. They had all heard about the Park. They all knew what overhunting meant, how foreign hunters came to profit from the richness of their forests, but now they had to consult the ancestors. The forest belongs to the ancestors. Word of “tambiko” spread. Preparations were made. In the end there were three “tambikos”, one among the northern Balanga ethnic group and two among the Bangengele ethnic group. I know that we did not witness the entirety of any of the rituals, but we certainly saw more than I expected; more, I think, than mamaChefitaine expected. Short photo documentary below. An elder of the Balanga mixes herbs, traditional alcohol and his saliva, speaking all the time to us and to the unseen ancestors. Another chief of the Balanga speaks emphatically, punctuated with traditional bell, wearing a suit and tie for effect. 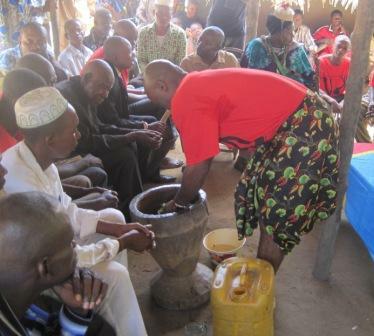 Then he adds alcohol and his saliva to the traditional mix. 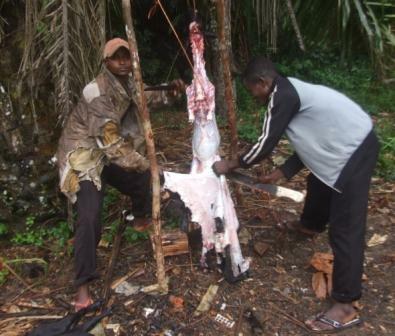 Goats are slaughtered for the feast after the Balanga “tambiko”. At the Bangangele “tambiko” in the village of Olangate a chief cries out the plight of his people to the morning sun. 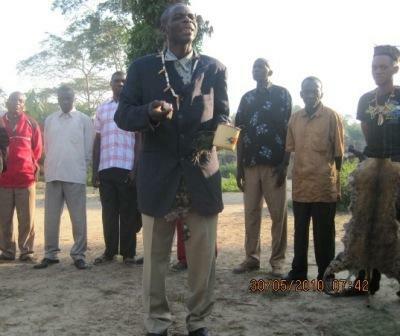 He is dressed in suit-coat, traditional genet skin and power necklace. 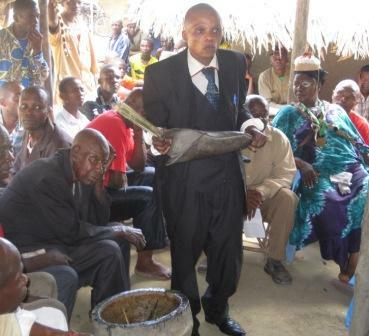 A Mungengele elder, surrounded by other cheifs, spits alcohol and herbs to show his acceptance and the ancestors acceptance of a park along the Lomami. 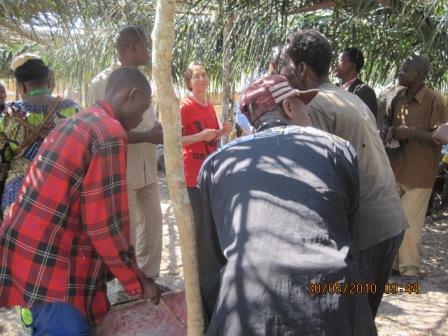 Afterwards we all danced to the traditional talking drums. The mayor of Kindu (a Mungengele) to my left and the mamaChefitaine beyond him. This entry was written by Terese Hart, posted on 2010-08-01 at 4:10 pm, filed under Bonobo, Indigenous peoples, Okapi, The Forest. Bookmark the permalink. Follow any comments here with the RSS feed for this post. Trackbacks are closed, but you can post a comment. We must move like a giant boulder coming down from the sacred mountain–unstoppable — to protect what is left of our Mother, Nature, and our cousins of the forest.